Over the decade, Soulcry has mellowed and matured since his excommunication with the Skywings. He has had a terrible reputation, but his notoriety has since then faded, and he is much more responsible with his life. He has neither plans nor intentions of anything to do with the Gods, they have been reluctant with him it seems, or straight out ignoring what he's been praying about; well, aside from daydreaming of becoming one of course. Aside from that, he will not be associated with them anymore. As for the evolution of Soulcry himself, like mentioned above he has matured. He has forgiven himself, and he has recently become an icewing. He favors the icewings very much, since they are peaceful and isolate. This is like him very much. Before he used to socialize, but now he likes to take time for solitude and meditation. His personality is still dark, not necessarily sinister: it never really had been. But rather than be confined to his perplexing views of the world in a duality of neither light nor dark, he has taken a much more cold, sobreing, and realistic outlook on life. It is much more possible to him that, especially after the apocalypse and having somehow survived it without interacting with beasts of any kind, moreless observing the nightmares of his past self, as if somehow “personified” uncannily his prior self, which compels him to see the world with three eyes that say, maybe this is just a dark, cruel world. Having said that, he is more reserved when he speaks. He is more of an isolate personality rather than overdramatic, and at times even silly. He isnt silly anymore, it turns out he's a bit embarrassed, but found a new life as a noble hearted draconiforme, who uniquely shaped his journey with much exercise and a great diet of fish. He is a guardian now, and he loves his new life, ckmpletwly letting go of all the friends he made as a skywing and as a rogue, maybe he might encounter Wake again, but who knows. Also, he will more than likely eat dolphins from now on. Dislikes:Tempers, foolishness, dullness, and shallowness. Scales: White, translucent scales covered by a fur of brilliant sheen. Eyes: Indigo emanating a static electrical aura. General Appearance: Pure white silver with an indigo and cyan glow. High contrast, dark arms connected to his four wings. A prominent, physical third eye. A transparent body. A flat, vertical tail with a phantom-like energy sphere at the tip of his tail. Strengths: He is intuitive equipped with a keen sense of vision he uses to scope out the feild and can focus on multiple targets. He is evasive and elusive, with mostly skywing herritage he is quick and nimble and highly meneuvarable. He is intentive about being stricken as little as possible. From his mouth he can breathe cascading, spiraling lightning, sparkling with icy crystals. The crystals are razor sharp, and the lightning emitted is accompanied by a dark vortex or cyclone that forces these crystals into extremely fast rotation. It has a blasting effect on the opponent. The attack stretches up to 300 feet. Although it loses its power over distance, it also widens. It's his most powerful attack. Can be used once every three posts. From his third eye, a more focused bolt of lightning can be shot. Its not a cascade; rather it is a single, more narow bolt. It is more accurate, though not quite as powerful. It is high in contrast, dark and ultraviolet at its core and it beams brilliant white light. As the appearance suggests it is both a lightwing and nightwing ability too. It has an electrocuting effect. The bolt is dense, due to this fact it has a much shorter range of 120 feet. Can be used on time per three posts. 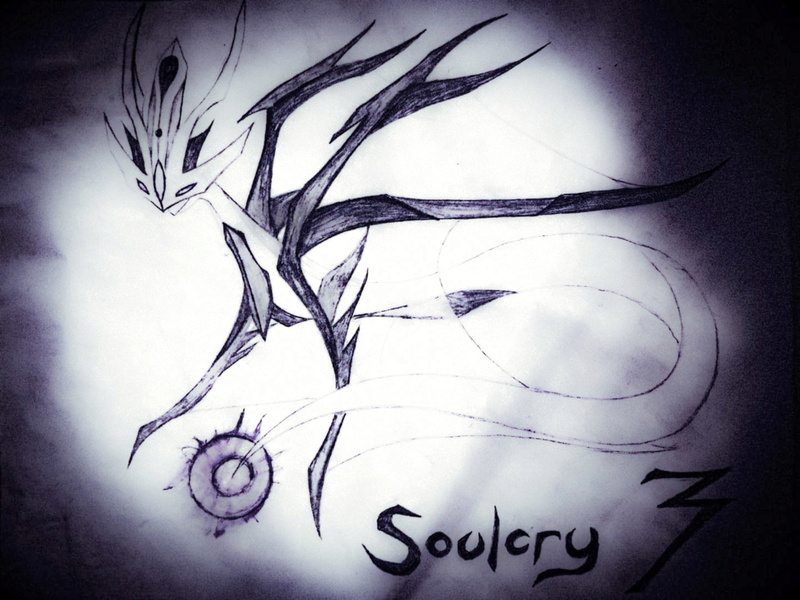 Like a radar, Soulcry uses his sixth sense to emit waves that penetrate haze, fog or smoke and even physical objects or pich dark to see. Can be used every two posts for the durration of the post, and has a range of about 150 feet. -His foreye is very sensitive to light and very susceptible and vulnerable to attacks. -His stomach is very soft and vulnerable, but not nearly as vulnerable as his eye. -As a tiny part icewing he is slightly weak to fire based attacks. He is also weak to Earthwing based attacks. -In order to maintain his nimble speed and maneuverability, he is delecate and lightweight. -His abilities all require time to recharge because they are so powerful. -He has no resistances to the elements. Combat Style: Soulcry is much better in the sky than on ground. On ground he scurries if he feels overpowered, but is very confident if he shows himself in the air. In the air he can evade and typically see anything with eyes like a hawk. He tries to feel the pace of the battle as intuitively as possible, and usually stays at a medium to shorter distance away to strike opponent with lightning, in an attempt to make himself more accurate and powerful as well as distancing himself from his opponent when he is not offensive. History: As a child Soulcry and his brother Phase split in Nightwing territory. Wheras his brother stayed, Soul fleed to skywing territory. There he learned in school and eventually began fighting. 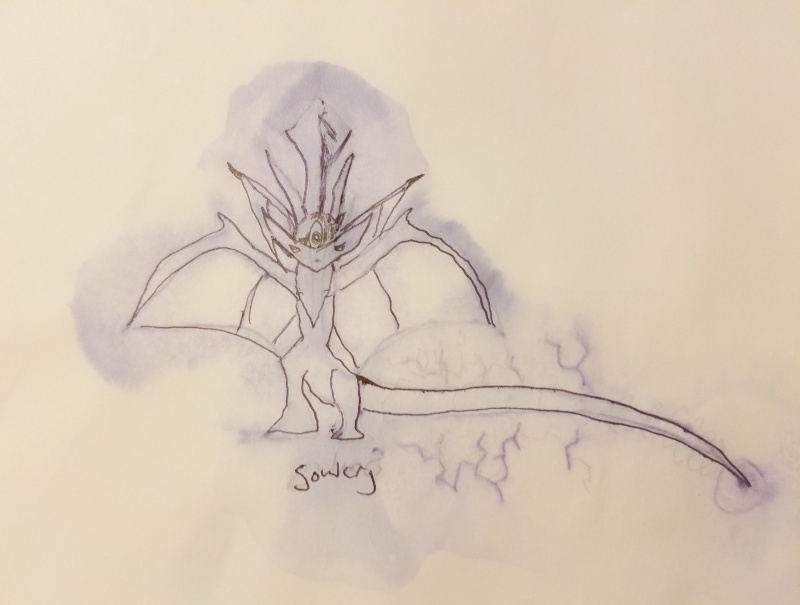 Unfortunately, though, after a combat once there, he was forced to leave skywing territory after accidentally killing another dragon in a fair fight. He tries not to fight as often as possible anymore because of it. RP Style: Soul solemnly draped his head over the cliff. It was a long day for him, and he was heavily conflicted because of murder. Two immense guardian dragons stood behind Soulcry, one of them spake. “We should have you arrested,” said the guard. And Soulcry leaned over the ledge a little more, and gazed at his daunting journey afore him. He turned back at the guard who had spoken, gave a begrudging eye twitch and a remorseful snare, before leaping into the sky. While he flew he had vivid flashbacks of being a child, and remembered how scary it was travelling away from his home. He remembered all of his favorite moments of growing up at skywing territory with tears rolling down his eyes, until finally it sank deep how brutal of a baggage it was he had to live with. And thus, Soul vanished into the horizon, where no one saw him from skywing territory again. Lets try it again, lol bump. I have a few things I just want to clarify. Hydra wrote: Fears: becoming evil. But doesn't your personality with state that he is, at his core, a dark spirit? Doesn't this imply that he is also already evil and therefore contridict itself? Change this fear as it doesn't make sense. Does this mean you have diamond hard scales? If so, this should also be in the strengths ability. However it is also too strong and would need to be reduced. Unless you mean they are diamond coloured scales, then that is fine. How does this work as a unique ability? You have stated that he can breathe this spiraling lightning that has a mixture of icy crystals? With this, more detail needs to be added. What damage does this inflict on others, how often can he use it per post and is it a powerful ability? What do the icy crystals do? More detail needs to be added to this, and I need all the points and questions I asked in this answered. It doesn't have to be a giant thing explaining thoroughly how it works, but something that we can use so that we at least know... well, how it works. Hydra wrote: From his eye, a more focused bolt of icy lightning can be shot. Both attacks require him to charge his energy for 12 seconds in between strikes, using one or the other at a time. Though, he does begin the battle at full capacity. Either type of strike can be dark or light in color indicading it being a nightwing or lightwing attack, or a high contrast combination of the two. Instead of using a one second delay, I would like you to state how many posts that he has to wait before he can use it again. Or if it's a one post per ability sort of thing. How does full capacity matter? I don't see the point in this being here, unless you are trying to say that he can only use this ability when he is at full capacity or above a certain limit? Why is this 'full capacity' here? If it was a typo, please remove this as it's rather redundant. However, if it serves a purpose, it needs to be explained. How does he get to full capacity, why does he need it and does it drain him when he uses his abilities? Just basic things like that. And what's the difference between the LightWing and NightWing attack? It's lightning based and lightning only comes from SkyWings. How does this attack suddenly have the power of night or light if it's a different colour? What are the effects of this change? Explain to me why it's important for him to have this attack changing it's 'base' tribe when he uses it because lightning is almost a guaranteed hit because of how fast it is, it doesn't need additional elements added to it. 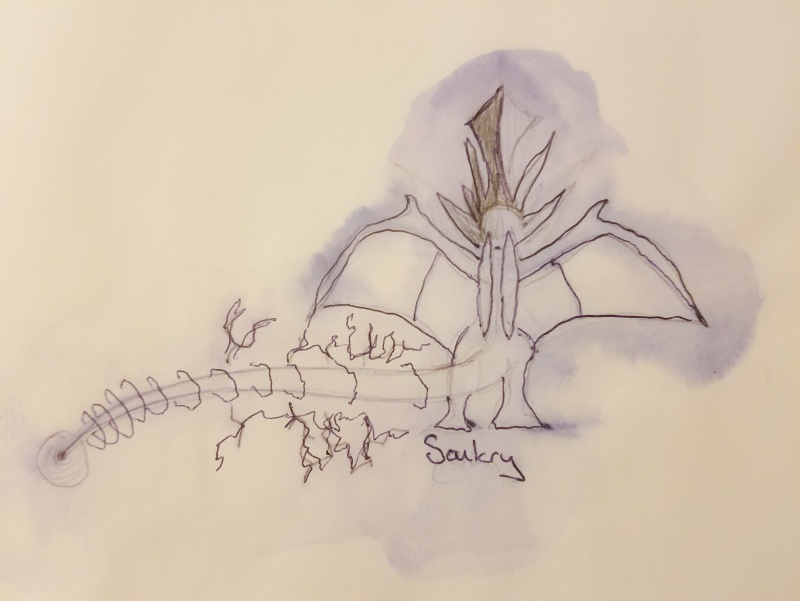 Hydra wrote: Ultraviolet-electrostatic echolocation - like a radar, Soulcry uses his sixth sense to emit waves that penetrate haze, fog or smoke and even physical objects or pich dark to see. The radar has 1 second delay, however, and can only be used at 6 second intervals. Using it for 6 seconds, and then off for 6 more at a time. This is because it requires energy as well, which must recharge. Okay, my biggest issue here is that you have absolutely no limit to this ability. That's kinda OP because you are basically able to sense where every single dragon and human are for 6 seconds. So, again, I want you to have a limit in this, how far is he able to sense to? Is it only to a certain distance like 200 feet? 400 feet? How far is he able to use this ability for it to still be accurate? Instead of putting this into seconds, maybe put in how often you can use it. For example, once every 2 posts or so. How often can you use this ability and what is it's range? With your weaknesses, most dragons share the weakness of the soft underbelly and the weakness of the eyes. For example, in a fight, if any dragons eyes or underbelly were to be damaged, they would also be severely hurt like Soulcry would be. Due to this, I don't really see it as a true flaw or weakness in your character. I would like you to add more weaknesses to your dragon and have them as actual stand alone weaknesses that your dragon really is weak to. It could be that his skills might be powerful, but they take a long time to recharge. Also, you state that he is quick, would he be able to dodge every single attack, or would he be able to be hit by surprise or sudden attacks? You have all abilities of all tribe blood you have and your skywing abilities are that of a full SkyWing as well. In order to accept this app I am going to need you to have no resistance what so ever to any element or tribe ability. Do you want me to change both? Also, all I did was change the color, added underlines and bolds, and added in on his personality that he is mysterious. Lets have 3 post recharge time instead of 1. Out for edits. Please put all changes/additions in bold print.